The Canon EF-M 55-200mm f/4.5-6.3 IS STM lens with EF-M mount is designed to bring you closer to the action. The lens is equipped with a 3.5-stop optical Image Stabiliser (IS) which prevents blur caused by camera shake and Canon's advanced Stepping Motor Technology (STM) to ensure smooth, quiet focusing when shooting movies. Its versatile zoom range brings distant subjects closer - great for wildlife, sports and travel photography. 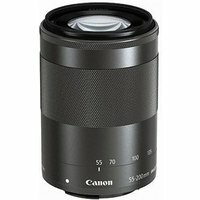 This lens is compatible with Canon's EOS M range of compact system cameras.